In 2013, the small village of Flåm had to say no to 15 cruise ships. Beautiful Flåm is situated in the innermost part of the Aurlandsfjord, a tributary of the 127 miles (204 kilometres) long and up to 4291 feet (1308 metres) deep Sognefjord. “Flåm” means “little flat area between steep mountains”. The limited capacity to accommodate many tourists at the same time has become something of a luxury problem for the small Western-village placed between mountains and narrow valleys. Having to reject cruise ships with thousands of tourists who come to spend money must feel a little strange. Last year, Flåm received 151cruise ships. This year, the number is 171. In 2011, 157,000 cruise passengers visited the small village. Last year the number had risen to 200,000 – and this year it looks like 230,000 cruise passengers will be visiting Flåm. Flåm, with its about 400 inhabitants, has been a cruise travel destination since the 1800s – and is like Bergen, the capital of Western Norway, experiencing that that the cruise ships are becoming increasingly larger. Also the popular Flåm Railway breaks all records. 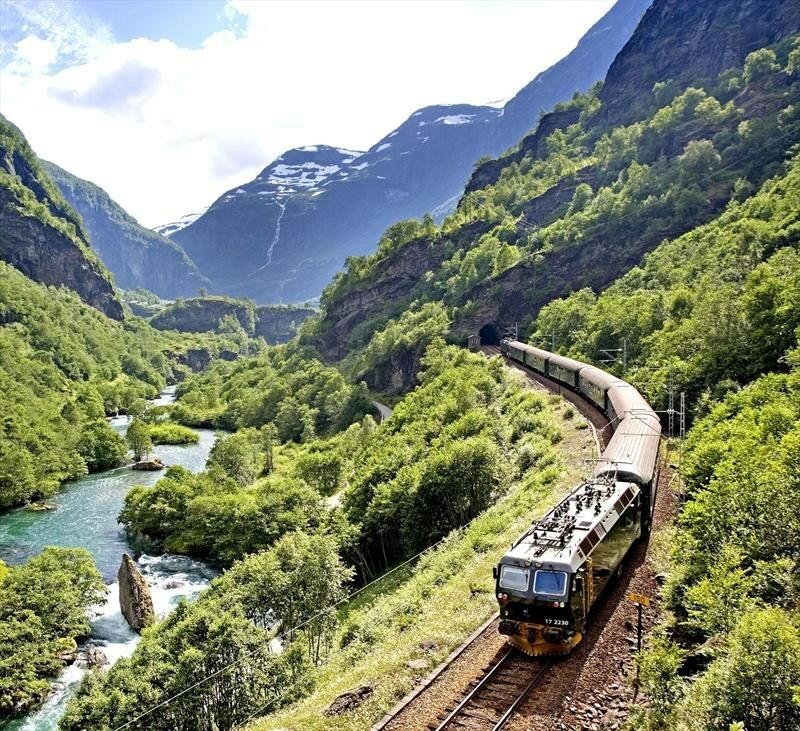 The train – which not only is filled up with cruise passengers, but also other tourists and ordinary rail passengers – breaks all records, and has strengthened its position as one of Norway’s main tourist attractions. The Flåm Railway is an incredible train journey from the mountain station at Myrdal on the Bergen Railway, down to Flåm station nestled in the innermost corner of the Aurlandfjord. ‹ Angry Resident: – Read the Writings on the Wall! I hate to see the town lose income, but cruise ships are horrible polluters, dumping trash and sewage as they go. That whole industry should be banned. Hopefully the government doesn’t allow them to dump while in the fjords.